- CINTURE IN CUOIO DI NS. 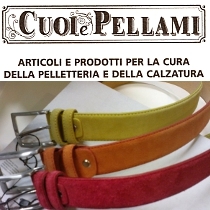 PRODUZIONE DA 30/35/40/50 mm. - FUSCIACCHE IN VERA PELE (MADE IN ITALY) DA 4 OPPURE 7 CM. - TINTURE PER TESSUTI (Cotone/Sintetico) "DYLON"